Video Mentor « Knapp I.T. The book I wrote on ITIL V3 is now outdated. But there’s a new 2011 edition out now! Read below for more information. 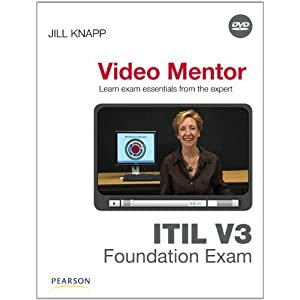 In 2009, I wrote a book called ITIL V3 Foundation Exam Video Mentor which was published by Pearson IT Certification in early 2010. It is a combined book and DVD set which contains hours of instructor-led presentations providing both foundational reinforcement of exam topics as well as exam preparation tips and sample questions based on the ITIL V3 exam syllabus that was current at the time of publication. But wait! There’s news! 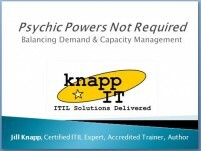 There’s an new product that’s updated for ITIL 2011! Yay! I am thrilled that my ITIL V3 Foundation Exam Video Mentor was in my publisher’s (Pearson IT Certification) Top 5 best-selling publications every month since its release. THANK YOU! And because of that, on January 5, 2015, I signed a contract with Pearson to create an updated version! This time it will be 100% streaming video only… no accompanying book. Don’t worry though; if you like having printed material to highlight and study from, I’ll make that available here on my website. So… to buy the latest edition, head on over to Person IT Certification (or Safari Books Onlineif you prefer) and start streaming! Thank you so much for your kind words– I’m so happy that you are enjoying my work! i followed your lessons on safaribooksonline, really it’s amazing. you are the best to do this job. waiting for your ITIL 4 lessons. Thanks so much for checking out my videos on Safari! I really appreciate your kind words; I had a blast making those videos. I do plan on making videos for ITIL 4, but I won’t be creating them for a good while. As you know, ITIL is a set of books… and ITIL 4 will also be a set of books, but only one of the books of the set has been written so far. I don’t feel like I can make videos about ITIL 4 or be an expert in ITIL 4 until all of the ITIL 4 books get written and published. The current version of ITIL (ITIL V3/2011) isn’t going anywhere for a good long time, so it’s still a good idea to continue with your ITIL 2011 studies. But when I’m ready to launch my ITIL 4 books, I’ll let everyone know! Yes, there will finally be an update to the Video Mentor book! « Knapp I.T.